Property 4: Comfy home opp Gilmour Lake. 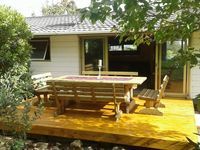 Property 5: The Paeroa Bungalow..
Property 16: Silverstream Cottage, nestled next to the Mangatoetoe Stream. Stables On Frankton Waihi The Coromandel. 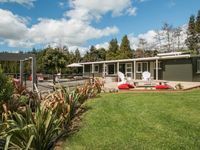 Property 17: Stables On Frankton Waihi The Coromandel. TUI COTTAGE is a character cottage in Waihi. Property 20: TUI COTTAGE is a character cottage in Waihi. Property 23: Haybarn House. This house has a round roof. I have an extremely spoiled cat. Quiet rural lifestyler with wonderful views. Few mins to town and to surf beach! Property 28: Quiet rural lifestyler with wonderful views. Few mins to town and to surf beach! Stylish property in a beautiful and relaxing location. Highly recommended!